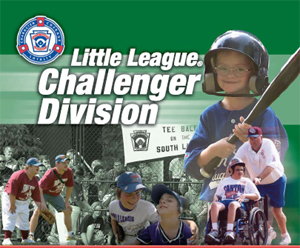 The Challenger Division of Little League is a program for mentally and physically challenged youth, helping them to enjoy the full benefits of Little League participation in an athletic environment structured to their abilities. More than the skills of baseball learned through the experience, the value of the Little League Challenger Division is found in the proven therapeutic and socialization benefits of participating in sports, the strengthening of participants’ self-esteem, the opportunities to mainstream into other divisions of play, and the disciplines of teamwork, sportsmanship and fair play, which are hallmarks of the Little League program. Playing with the same equipment on the same fields, Challenger Division participants have the opportunity to experience the joys of pulling together as a team, being cheered, and earning awards for their achievements. How does the Challenger Division work? All Children ages 5-18, or who remain in school, with physical or mental disabilities are encouraged to participate. Level of play based upon player’s size, age and skill level are recommended where numbers allow. Teams can include as many as 15 players. Players can participate in one of three levels and some levels may use the “Buddy” system. However, it is not mandatory. Every player on the roster is in the batting order and shall play defensively for the entire game. The side is retired when the offense has batted through the roster, or when three outs are recorded. No score is kept during games. Challenger Division players wear the same uniforms, shoulder patches, and safety equipment as other Little Leaguers. Games are played Sunday afternoons in April and May. There is no fee for participation.